Sometimes you see the storm coming from miles away. 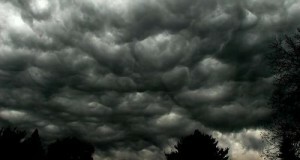 The sky darkens long in advance, the thunder roars loudly from a distance, the wind whips up and turns cool. You expect those storms and can plan around them a little, or at least plan for them. I don’t mind a good storm. You can enjoy it while lying in bed late at night. Or you can find a dry place, at least carry an umbrella while you are walking through it. You can wait it out. Of course, storms aren’t always welcome or even tolerable. The sun can be shining and there is no rain in the forecast at all when, suddenly, the sky opens up and it absolutely pours. Sometimes they come with great ferocity, bringing with them fear and devastation. So often when that happens, you’ve left the car windows open, or you are sitting at a ballgame and get drenched. It’s entirely possible your plans for the day get completely ruined. Even worse, the storm could come with high, dangerous winds and hail in the spring, bitter winds and heavy snow in the winter. Any of those storms can pose a challenge. Obviously, life is a lot like that. I’ve experienced plenty of both. I know you have as well. We often need live only a short period of time to endure something truly difficult. Many years ago, I had a young cousin who was stricken with leukemia and died before he reached the fourth grade. A friend died of cancer before graduating high school. To be honest, I don’t understand storms like those, where lives are taken away, and I probably won’t until I talk with Jesus in heaven one day. So I mistakenly thought the only good way to get through life was to avoid the storms. When I was a young dad, I spent a lot of my prayer time talking with God about my children. I asked that He bless them with trouble-free lives, with happiness and good friends and a solid education, to keep them out of trouble, to one day give each of them a wonderful spouse and Godly family. I mean, who wouldn’t want those kinds of things for their kids? Right? At some point, I gained some insight during those prayers. I learned to ask for the same things but in a different way, a more realistic way – albeit a way that is more difficult for me to actually verbalize in prayer. Now I ask God to allow storms in their lives. I ask that in prayer for all people I love, to be honest. You’ve got to understand how hard that is to say. I don’t want to see special people hurting or in pain, dealing with disease or financial hardships or anything else that might bring along tears or anger or even hospitalization. But having examined my own life carefully, I know how important those storms can be in building faith and character. My faith grew stronger last year when I didn’t feel God’s presence at all and couldn’t pray. My empathy for the suffering of others with mental illness has grown stronger because of my 11-plus years of depression. My appreciation for certain friends in my life has grown stronger because I don’t see them as often as I wish. My love for my wife has been so strong from the beginning because of previous heartbreaks. My desire for and enjoyment of success has grown stronger because of failure. My appreciation for my parents has grown stronger because of crying alongside friends who lost their parents. My desire for forgiveness has grown stronger because of sorrow for my sins. If I would pray that God would deny any of those difficulties or others in the lives of my children, friends or family, then I would be asking God to deny those people the strength and blessings that come with those challenges. Spend some time in prayer soon. Think of all the storms that have popped up in your life through the years and how different you would be without them. Ponder that for a while — and thank God for the storms. Really. Thank Him. Over time, my prayers have been refocused. I pray that my relationships with my family and friends strengthen, that I can be there when they need someone in the midst of a storm, that I can reflect Christ to them in a way that increases their faith. I pray that God allows the storms in my life but is right there by my side, using the experience to teach me and strengthen me in whatever way possible. I think it’s a journey that will require enduring some storms.